Four Way Books, 9781945588228, 88pp. Guided by a poem assembled from “compliments” paid by a suitor to his girlfriend (which echo the endearments Anna Karenina’s Count Vronsky directs toward his racehorse, before she collapses under his weight and is shot), You Darling Thing investigates bridehood and the concept of the vow through the voices of a variety of brides, ex-brides, courtesans, and wives. The book is ultimately less about marriage than about potentiality and promise, an engagement with what seems possible before it stops being possible—anticipation at the outset of a hunt, embryos that stay unborn, youthful predictions for a life before it’s lived, and delight in the expressive possibilities afforded by language and art. 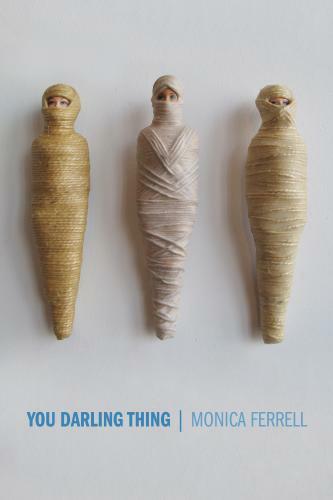 Born in New Delhi, India, MONICA FERRELL grew up in northern New Jersey. A graduate of Harvard, she holds an MFA in poetry from Columbia University. The recipient of various fellowships and residencies, Ferrell is the winner of the “Discovery” / The Nation prize. Her first poetry book, Beasts for the Chase (2008), was selected by Jane Hirshfield as the winner of the Kathryn A. Morton Prize in Poetry and her novel The Answer Is Always Yes (2008) was named one of Booklist’s Top Ten Debut Novels of 2008. Currently she is associate professor at Purchase College (SUNY).